The ALU is implemented using a M27C322 2Mx16 bit EPROM and the decode logic is performed using a M27C1024 64K x 16 EEPROM. This is in a 42 pin DIP and will require a special eprom programmer and adaptor socket to program - which may be a limiting factor to some home constructors. The access time of the large ROM used in the ALU is 80nS which will be a limiting factor to the clock frequency. Similarly the decode logic ROM has at best a 45nS access time. 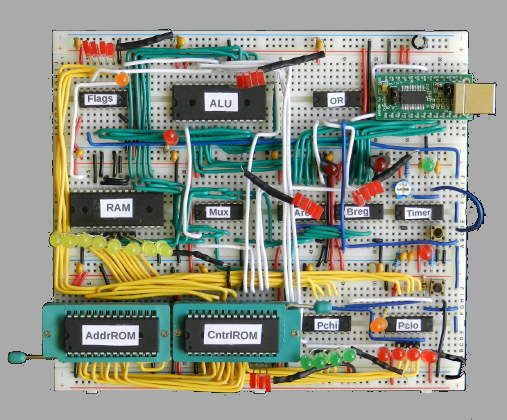 Nevertheless, the design shows how an 8 bit Von Neumann architecture can be implemented in a handful of TTL devices and four large memory chips. Last edited by monsonite on Sat Apr 13, 2019 11:50 am, edited 1 time in total. An interesting observation: not so many chips, but a great many transistors! Those are big EPROMs in impressively big packages. Still, the principle of making moderately simple hardware and then putting the detail into a lookup table or in microcode is a good one, when those things are cheap.